From 2008, Gihan Soliman, a Coptic Christian, was involved in environmental issues and sustainable development in Egypt. She is convinced that education on the environment should start at school, that education is the key for sustainable development – and that this should not be left to "sophisticated people, the well-educated, and the cultured". She collaborated in setting up an international Egyptian NGO organization, the International Foundation for Environmental Protection and Sustainability, to address the issues of biodiversity conservation in Egypt, and worked as an educational consultant in this area. She achieved international recognition for her work. She is also convinced that gender equality is at the heart of sustainable development and in 2012 as part of her activism established partnerships with women’s groups in Egypt for the first Orange Day* campaign. As a result, she was subject to life threatening violence which forced her to leave Egypt. Gihan Soliman will talk about the current situation of women in Egypt, which has been described by the BBC as the ''worst for women out of 22 countries in the Arab world". It is an opportunity to hear perspectives sometimes missed by the Western community due to cultural and language barriers. 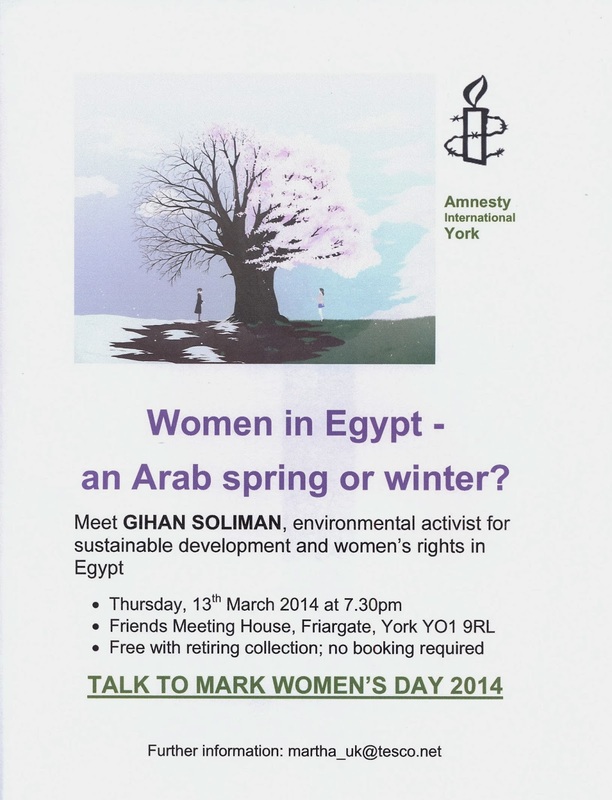 Gihan Soliman will discuss her own experience as well as the experiences of other Egyptian women. *In July 2012 the UN Secretary-General’s campaign to End Violence against Women declared every 25th of the month as Orange Day. Worldwide activities organised on this day by UN country offices and civil society organizations aim to highlight issues relevant to preventing and ending violence against women and girls.